Dr. Steve Radostits graduated from WCVM in 1988 and started working at Leduc Veterinary Hospital that same year. Initially he did mixed animal practice working on companion animals and farm animals. As the practice grew he focused more on farm animals….working on cows, goats, sheep, pigs and chickens. He has a special interest in dairy cattle production medicine and surgery but enjoys the challenge of individual animal medicine and surgery on any farm animal. As a practice owner and manager he is interested in providing the best possible patient care and customer service. In his time away from work he enjoys renovations of every kind, water skiing, spending time at the cabin, playing hockey, and spending time with his four boys, wife, and family dog Daisy. Dr. Somers graduated from the Western College of Veterinary Medicine in 2000 and has been serving the Leduc area since 2001. 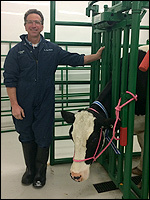 His expertise is bovine medicine and surgery but plays an active role in all aspects of the practice and enjoys the challenges of partnership in a busy practice. He enjoys snowboarding and hockey in the winter, and boating and camping with his family in the summer. 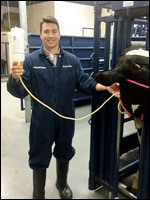 Dr. Boender was born in Edmonton, Alberta and raised on a dairy farm just outside Beaumont. He spent two years at the University of Alberta studying animal science before being accepted into the University of Calgary, Faculty of Veterinary Medicine from which he graduated in 2015. 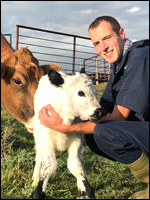 Following a year working in a mixed practice in Central Alberta he joined The Farm Animal Hospital where he previously spent many of his summers working as a student. Although he enjoys working with all species his main interest revolves around bovine medicine and surgery. He loves the challenge of each individual case and is always coming up with and trying out new diagnostic techniques. If he is not busy with cattle you might run into him working on anything from horses and goats to pot bellied pigs. Away from the clinic he enjoys playing hockey, basketball, skiing, riding his horses, traveling with his wife and working on his family's farm. The same farm where he loves to try out the newest product or medical technique. Make sure to ask him about the latest veterinary app when you see him next.